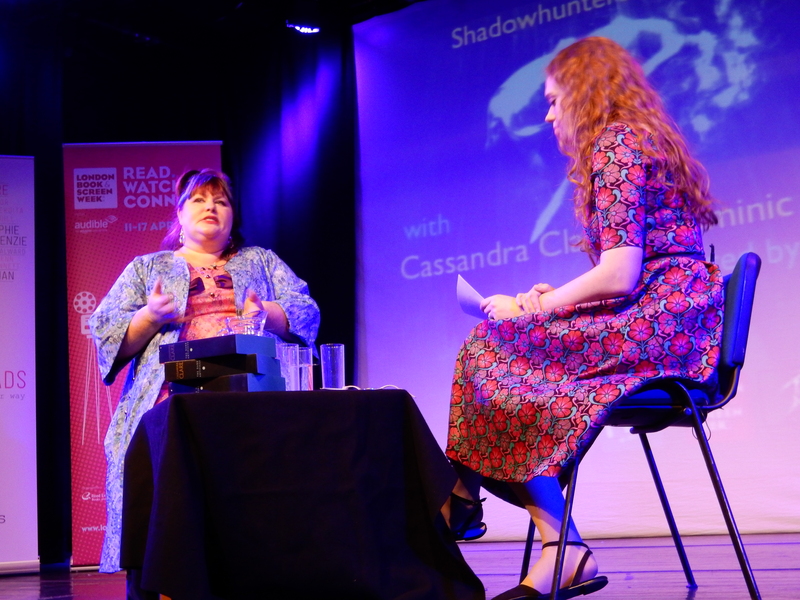 After Cassandra Clare’s Super Fan Event in London we once again had the amazing opportunity to interview her. Our friend Desi from Dutch Nephilim also submitted a few questions so Dutch fans will find a translated version over on Dutch Nephilim. TMI Source: Let’s talk about The Dark Artifices, was it more difficult or easier to write it? You got inspiration for TMI and TID, but for Lady Midnight or rather the whole series you decided that you wanted to write about L.A. because you grew up there. Was that an easier writing process or was it more difficult? Cassandra Clare: I think it was not specifically more difficult or easier but just different. I had the idea “I wanna write about parabatai who fall in love with each other” for a long time so it was good to actually get to write it out. But there were a lot of things about the book that were very different from the books I’ve written before. Usually they are about characters who are orphans or don’t have much family and this one was about a big family and I was an only child so for me writing about this experience being in a big family was extremely difficult because it was so unlike my own experience. But writing about L.A. was easy because I grew up there and so for me it was much less research and less studying than I had to do, especially for The Infernal Devices. TMI Source: You’re obviously still writing The Shadowhunter Chronicles and Magisterium with Holly, but at some point in the future you will be done with everything so do you have something you would really love to write about? Cassie: I’d like to do high fantasy. Make up a secondary world, invent a world like Westeros, that kind of thing. I’ve always wanted to do that since I was little and it’s actually kind of weird that I wound up doing urban fantasy first and not high fantasy. So I’d actually really like to write a high fantasy book. TMI Source: It sounds really interesting! TMI Source: Since we just talked about writing, what does your normal writing day look like? Do you have a routine or is every day different? Cassie: I try to have a routine. I get up, I procrastinate for a while, I usually start writing in the afternoon, I try to set a certain amount of words that I have to finish a day – usually 3,000 – and when I finish the 3,000 words then I’m done and I can do whatever. But if I don’t finish it I have to keep working. Usually Holly comes over and joins me for writing from about 1 o’clock to 6 o’clock or 6:30 pm. So we work together for most of the day. TMI Source: Are you also doing writing sprints like Holly does? Cassie: Yeah, we do them together. So we’ll say like “Okay, half an hour” and do the writing sprint. When we’re done we’re checking on the other person, “What did you get done? How much did you write?” It’s interesting. TMI Source: Procrastination is happening on Twitter, Tumblr…? Cassie (nods): I’ve been trying to schedule the social media stuff so that I have a couple of posts scheduled ahead of time, also on Twitter I’m usually only on for an hour or two in the morning and then not because otherwise it’s really too distracting. I can’t get on Twitter while I’m writing, it’s too disruptive. TMI Source: I can totally understand! Dutch Nephilim: Do you get writer’s block and what do you do about it? Cassie: I get writer’s block, everybody gets writer’s block! Usually writer’s block for me means that I took a wrong turn in the story somewhere so I try to go back through the story to look at the different points where the story branched off and could have gone a different way until I find the place where I sort of made the wrong decision and start to roll the whole story back to that point and start over again which is not fun, but you have to do it. Dutch Nephilim: Which writers inspire you? Cassie: A ton of writers. Obviously Jane Austen, but more modern writers. Neil Gaiman. He’s a big inspiration and I really love the way he weaves together mythology and folklore. Diana Wynn Jones, she’s a fantastic inspiration for writing children’s books. Tolkien, C.S. Lewis, Gabriel Garcia Marquez and a lot of the people who wrote magical realism. *Dutch Nephilim: A question about The Dark Artifices, will we get a new High Warlock of Los Angeles? Cassie (laughs): I think the High Warlock thing is super funny because it’s not that official of a position so if you’re a warlock and you move to a city, sometimes you’re the only warlock so you’re like “I’m the High Warlock”. So that’s how you wind up with the High Warlock of Brooklyn or something. I think probably for a city the size of Los Angeles the issue is gonna be that there’s probably a bunch of warlocks who want to take the place of the previous High Warlock so we’re going to meet some of the possible candidates in the next book. Some of them are nice, some of them are not so nice! *TMI Source: It will be weird to see him in The Last Hours when he’s still a nice guy. Cassie: It’s interesting to me. I like Malcolm and the whole idea of Malcolm was to create a character where people would like him because he is a lot like Magnus. People were like, “Why isn’t Magnus in this book instead of Malcolm?” and I thought, “You’ll find out! Magnus isn’t going to kill a bunch of people and chop off their hands!” He has a Magnus quality to him and a really terrible thing happened to him so he’s really interesting to me in the sense that he doesn’t have no motif for what he does. *TMI Source: Magnus mentioned Helen and Aline’s wedding in Lady Midnight, but he’s also met Julian and Emma at Jem and Tessa’s wedding. Will we find out why Julian and Emma can’t remember the other wedding? Cassie: You’ll find out why they don’t remember. Magnus remembers the wedding, Jem and Tessa remember the wedding, but no one else remembers the wedding. There is a magical reason why they don’t remember. Cassie: Why she’s hesitating? Yeah, she does have a good reason. It’s not that she doesn’t love him. She loves him! *TMI Source: It was nice to have this short story about the TMI characters. Cassie: Yeah, it was fun to check in with them, I enjoyed writing it. It was nice to see where they were all at. Jace grew up amongst Shadowhunters, they get married younger and Clary grew up amongst mundanes and she’s got it more in her system that marriage is something you do when you’re maybe in your late twenties. So I think the idea of getting married at 21 would be weird to her. I think part of it is that her mother got married so young and it didn’t turn out well. I think she’s probably a bit gun-shy because of her mum’s experience. It was fun to check in with the Mortal Instruments guys, see how they’re doing and how ridiculous their party was. TMI Source: So Lord of Shadows is done and about to be copyedited? Cassie: No, it’s done and needs to be edited which means edited by me. So it’s done in the sense that there is a first draft but it’s not done-done. TMI Source. Ok. Well, there’s still time until next year. Let’s end this interview with a few rapid fire questions. Favourite sweets? Cassie: Cadbury Eggs, Twizzlers, which I know is disgusting, and anything butterscotch. TMI Source: Favourite hero and heroine? Can be fictional, can be real. Cassie: Do they have to be a couple? Cassie: So maybe Éowyn from Tolkien. I love her, she’s great! And maybe Lymond from the Dorothy Dunnett Lymond Chronicles. Boy, would they make a weird couple! Cassie: Oh God, favourite villain? That’s a good one. Um, I can never think of these things when I’m on the actual spot and have to think of them. Who’s a really great villain? I like villains that are human and complicated and seem like people. Those are always kind of hard to find. Let me think about it and get back to you. TMI Source: Your favourite word. TMI Source: What does it mean? Cassie: It means “Things that happen at twilight”. TMI Source: Your favourite place in the world? TMI Source: France, nice. The last book you’ve read? Cassie: It was called Sorcerer to the Crown, it was really good. TMI Source: What genre is it? Cassie: It’s fantasy, high fantasy with a certain Middle Eastern setting. TMI Source: Interesting. Your favourite line from one of your books? Cassie: I think it’s got to be from The Infernal Devices because there’s so much how I feel about books in there so “Words have the power to change us”. TMI Source: Yeah, that’s a good one! Last question: Who would you love to write a book with? TMI Source: This would be a good one! Cassie: I think we’d have a good time! Cassie: I think it would totally work. I mean, why not? TMI Source: It’d be really, really interesting! Cassie: Oh! Favourite villain: Lucifer from Paradise Lost. Thank you so much to Cassie for another fun interview! We are definitely crossing our fingers for a Cassandra Clare/Rick Riordan collaboration and we cannot wait to see what other books the future will bring!